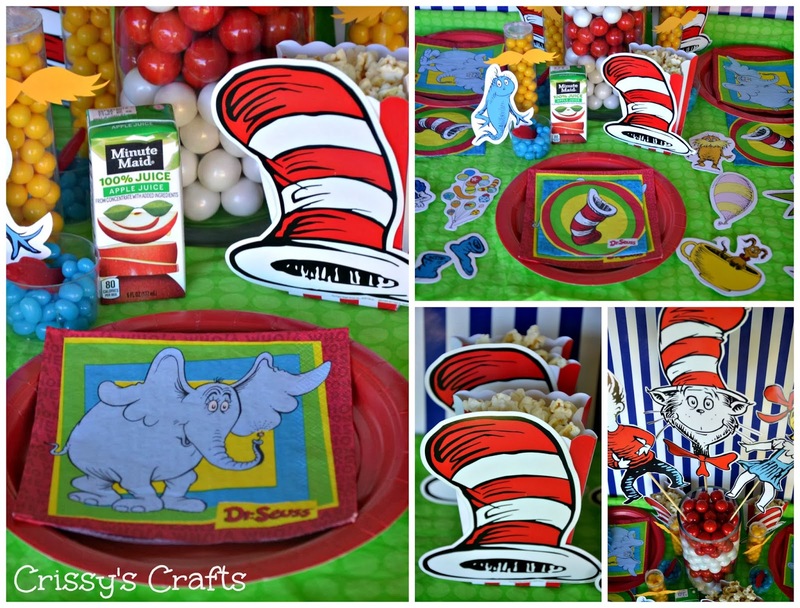 We partnered with Party City to celebrate Dr. Seuss Birthday and Read Across America week! 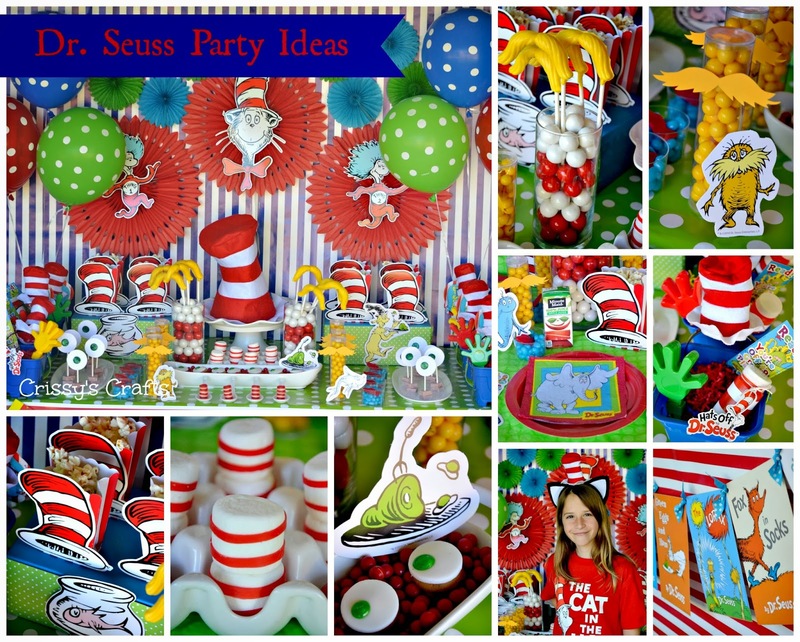 Here are some fun ideas for you to throw your own Dr. Seuss Bash! 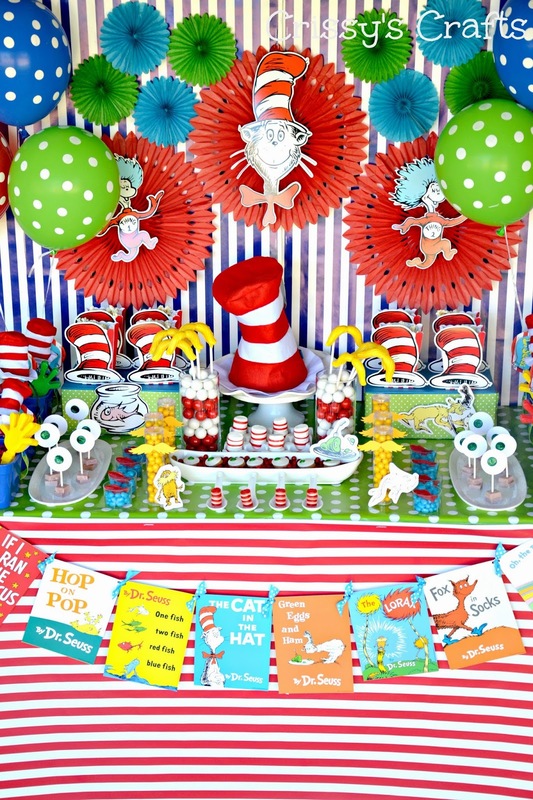 Party City has a special section with Read Across America supplies that make it easier to put together a party with no hassle! 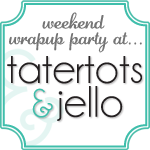 I love using wrapping paper for backdrops but this time I also used them as a tablecloth! 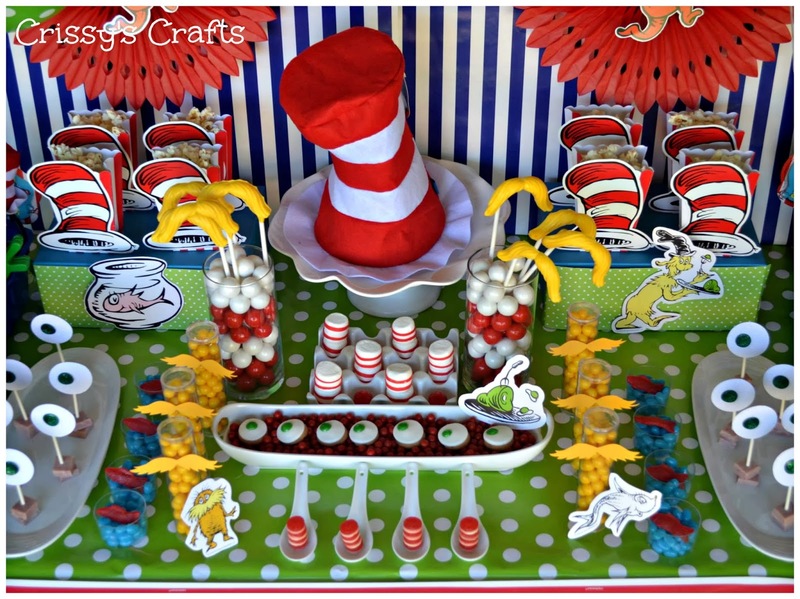 It made the whole table fun and colorful! 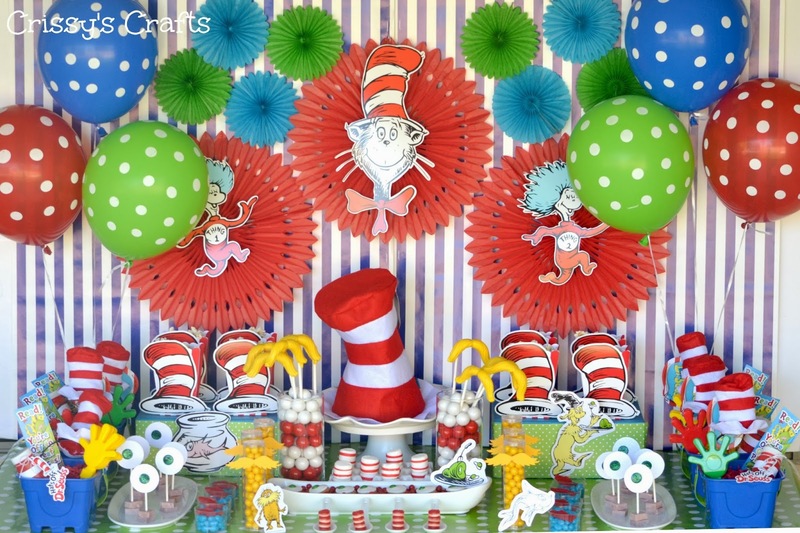 I also added some paper fans and embellished them by gluing Cat in the Hat Character Cut outs. I added some Polka Dot Balloons for an extra pop of color. 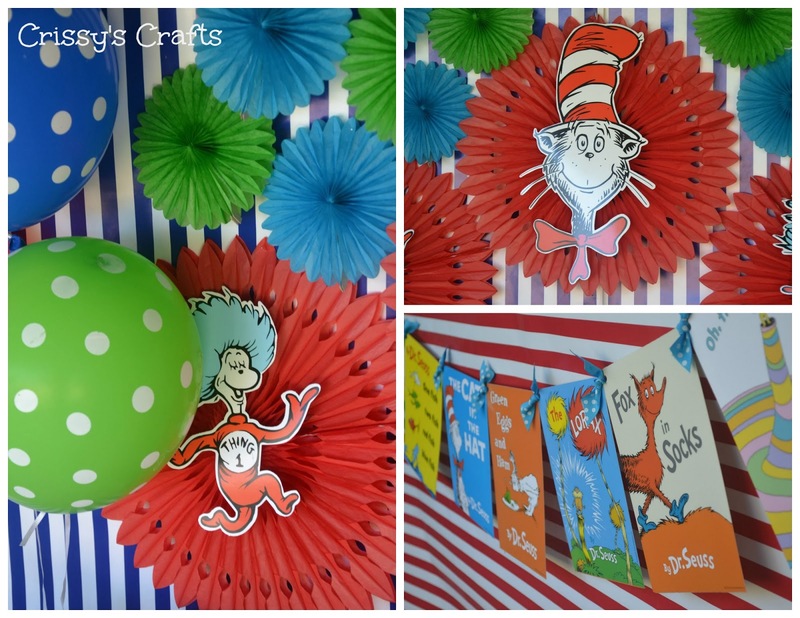 I also used the Dr. Seuss Book Cover Cutouts to make a banner. 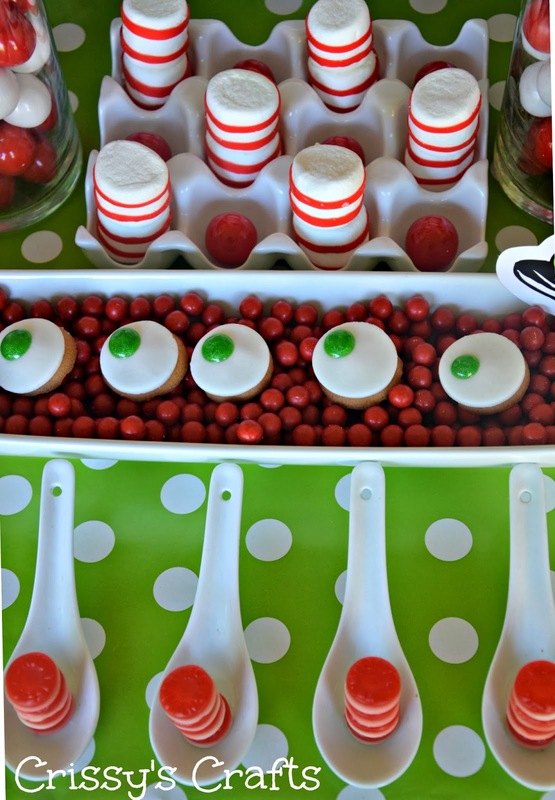 I made Cat in The Hat marshmallow treats using marshmallows and Red Fruit by the Foot, I stacked LifeSavers Berry Bites Gummies to resemble Cat's hat and made some green egg cookies using Vanilla Wafer cookies, fondant and Green Sparkle Gel. 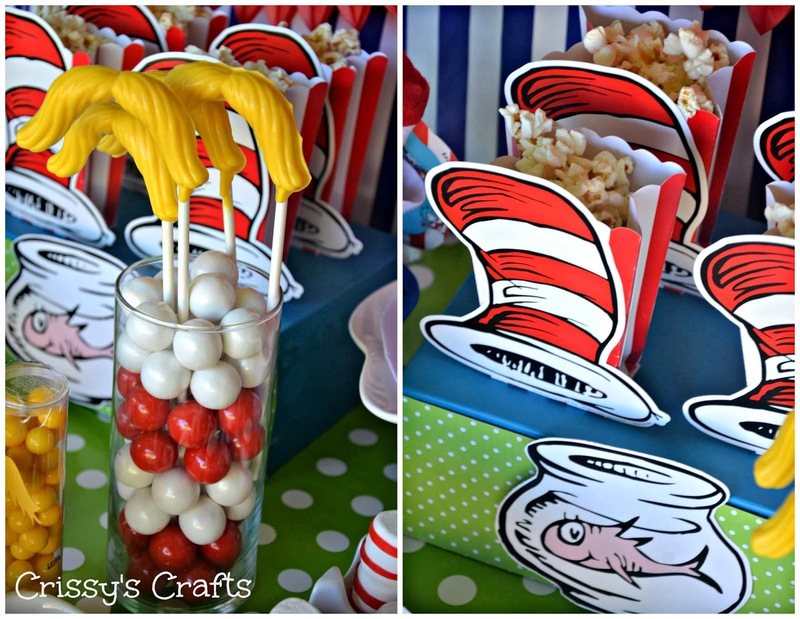 I made the Lorax mustache chocolate pops using the Mustache Candy Mold and added the Cat in the Hat Cut Outs to the Popcorn Boxes. 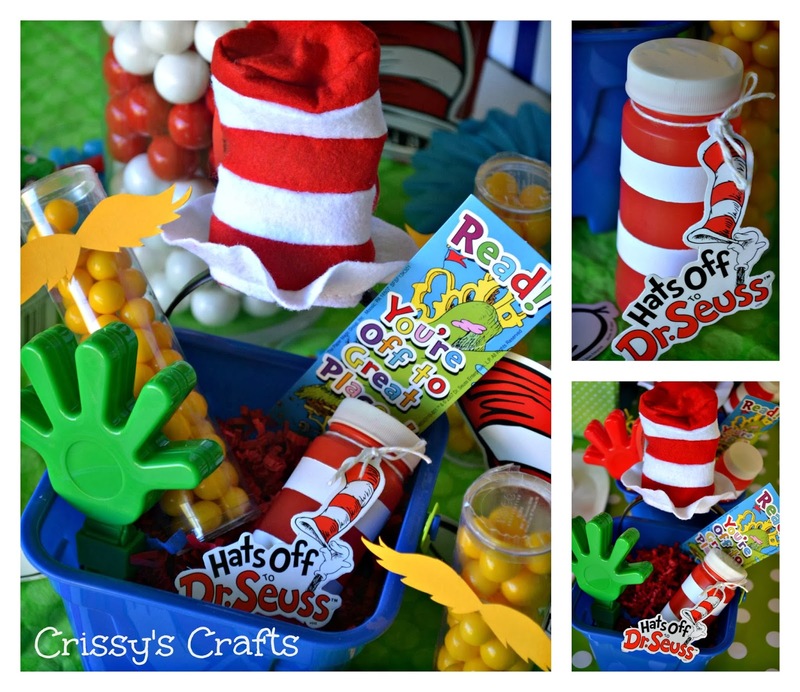 Fun favor ideas for a Dr. Seuss party are Mini Cat in the Hat Headbands, Dr. Seuss Bookmarks, Lorax Mini Gumball Containers, Clappers(Hands Up for Reading) and bubbles dressed to look like Cat in the Hat's hat. 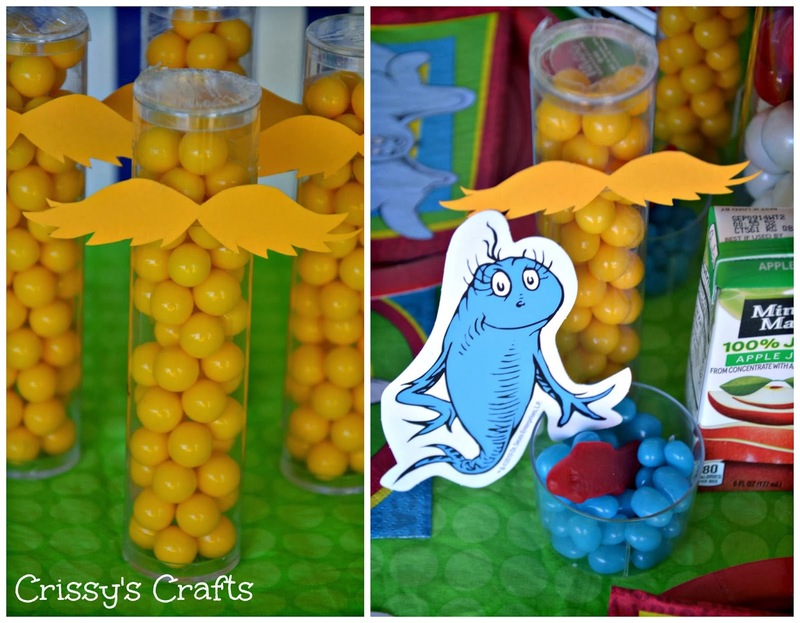 We also added some fun treats using blue jelly beans and a red fish inside Mini Clear Plastic Bowls in honor of my daughter's favorite book from Dr. Seuss, One Fish Two Fish Red Fish Blue Fish. 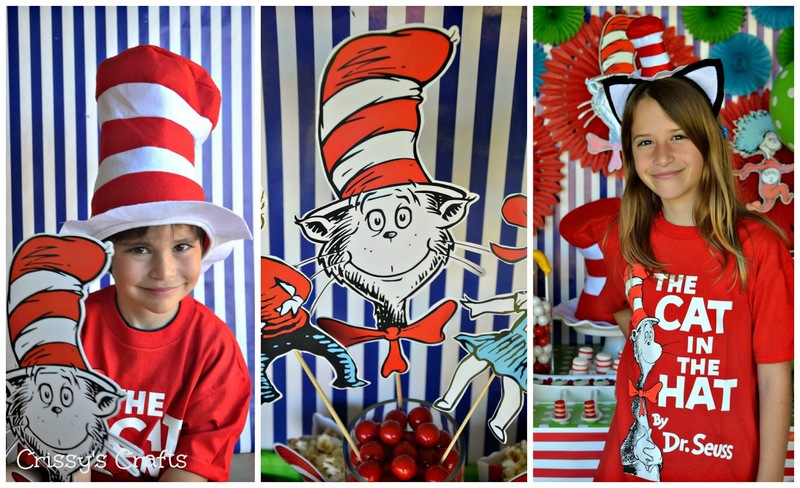 We also had a photo booth and used the Cat in the Hat Character Cut outs as photo props. 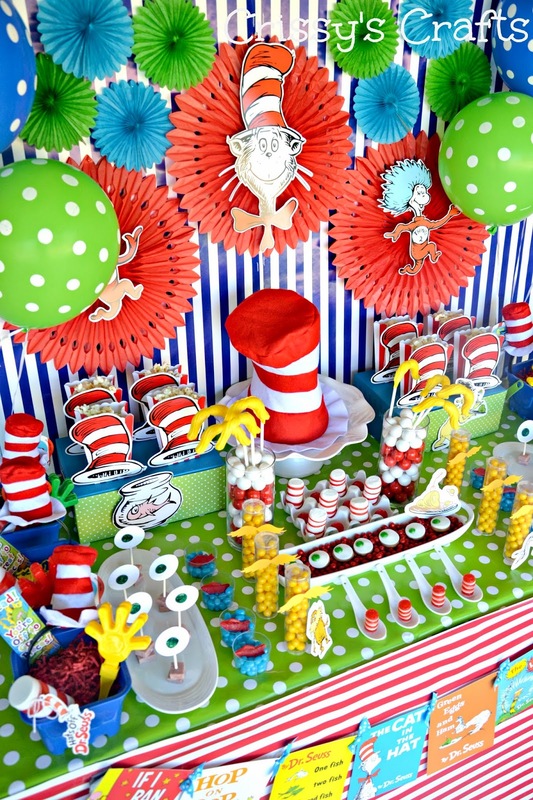 Hope these party ideas had inspired you for your Dr. Seuss Celebration! I would love to read your thoughts! Life is too short not to be anything but happy! 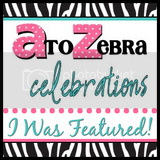 Here you will find all my past posts! A wonderful way to recycle, help Earth and make your yard look beautiful! 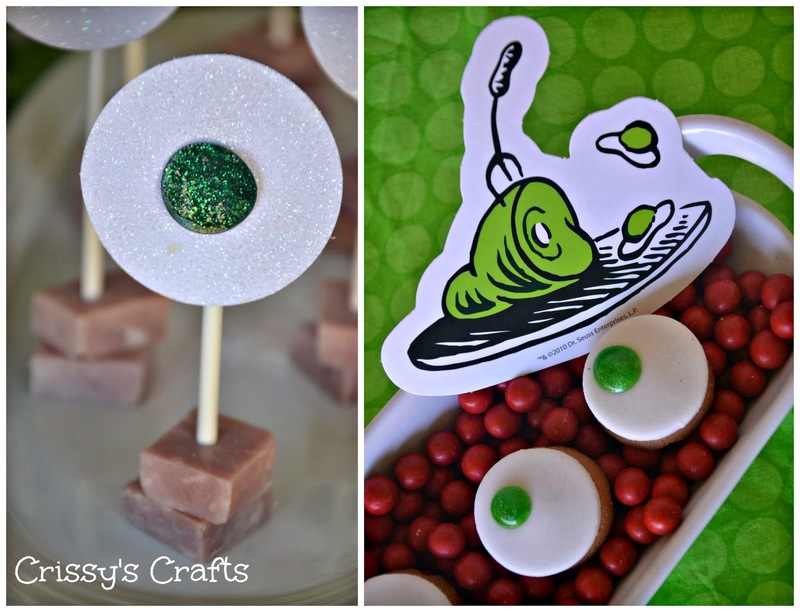 Disney's Frozen Party + GIVEAWAY! 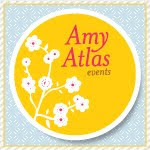 Do you want to share my ideas on your blog? Just ask! 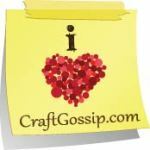 Copyright 2011 - 2012 by Crissy's Crafts. Simple theme. 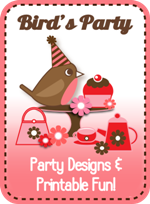 Theme images by chuwy. Powered by Blogger.